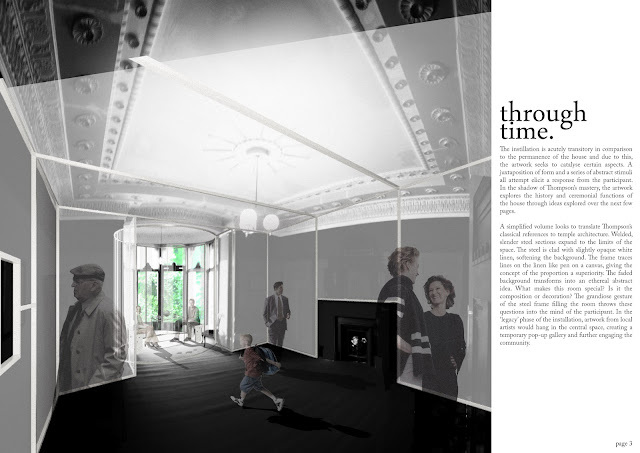 This was a competition to design an installation for the parlor room in Holmwood House, a local National Trust of Scotland property designed by Alexander 'Greek' Thomson. 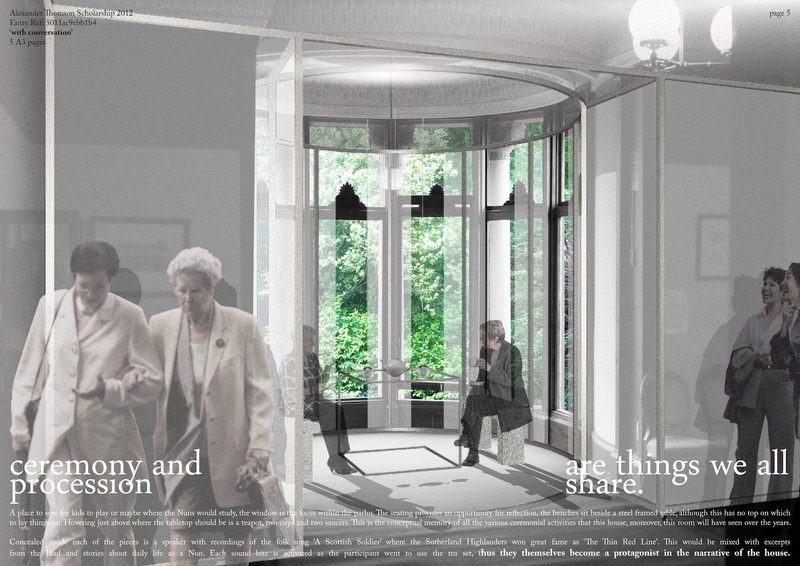 Thomson’s house is a story, devices from the distant past are re-imagined and incorporated with the present. The architectural style of Holmwood is an imaginative imbibing of classical sophistication and pressings of 18th Centaury life. Testament to the success of his designs, the house has had a long and varied history up to the present day. It was founded by brothers returning from the Crimean war and last served as a nunnery for the Sisters of Our Lady of the Missions before it was bought by the trust. In this house or ‘Villa’, Thomson executes the architectural composition so that the spaces embody his vision and in turn incorporates function, landscape and historical contexts. 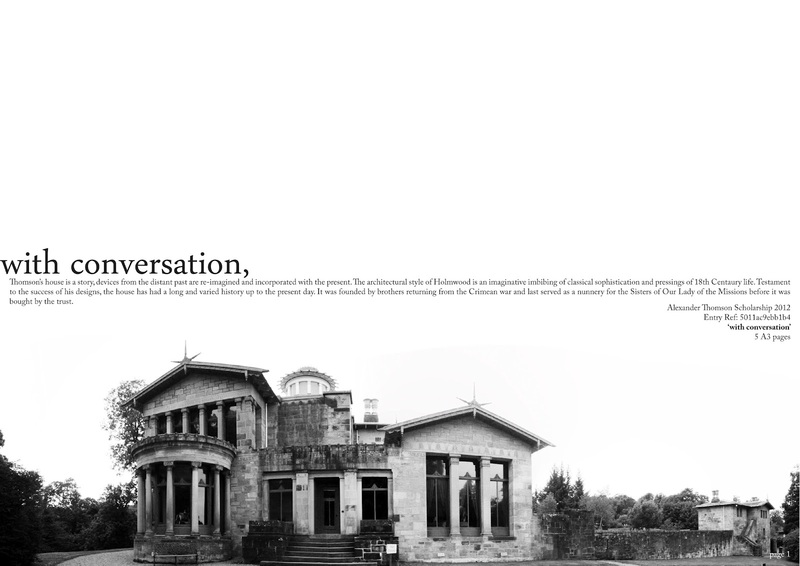 David MacRitchie notes in his essay (the villa) ‘is something both part of the landscape and something rising above the natural world.’ Essentially the artwork looks to express this multitude of conversations in a conceptual and ethereal manner to entice engagement and conversation on Thompson’s more subtle endeavors. The instillation is acutely transitory in comparison to the permanence of the house and due to this, the artwork seeks to catalyse certain aspects. A juxtaposition of form and a series of abstract stimuli all attempt elicit a response from the participant. In the shadow of Thompson’s mastery, the artwork explores the history and ceremonial functions of the house through ideas explored over the next few pages. 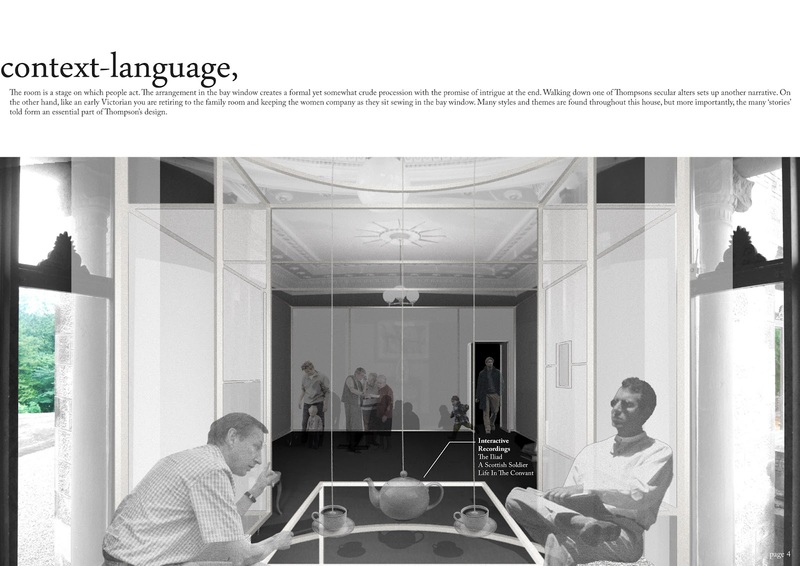 A simplified volume looks to translate Thompson’s classical references to temple architecture. Welded, slender steel sections expand to the limits of the space. The steel is clad with slightly opaque white linen, softening the background. The frame traces lines on the linen like pen on a canvas, giving the concept of the proportion a superiority. The faded background transforms into an ethereal abstract idea. What makes this room special? Is it the composition or decoration? The grandiose gesture of the steel frame filling the room throws these questions into the mind of the participant. 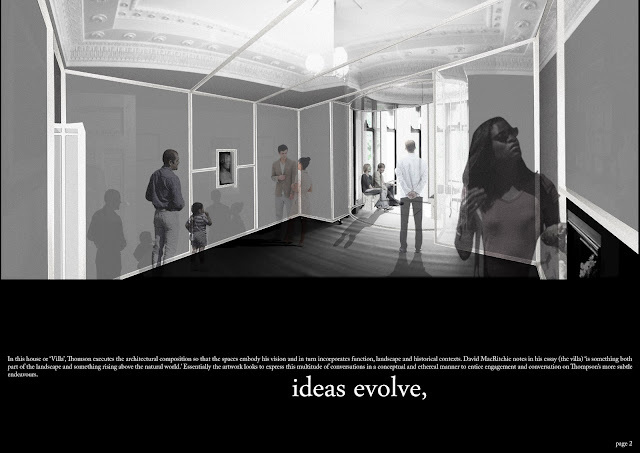 In the ‘legacy’ phase of the installation, artwork from local artists would hang in the central space, creating a temporary pop-up gallery and further engaging the community. The room is a stage on which people act. The arrangement in the bay window creates a formal yet somewhat crude procession with the promise of intrigue at the end. Walking down one of Thompsons secular alters sets up another narrative. On the other hand, like an early Victorian you are retiring to the family room and keeping the women company as they sit sewing in the bay window. Many styles and themes are found throughout this house, but more importantly, the many ‘stories’ told form an essential part of Thompson’s design. A place to sew, for kids to play or maybe where the Nuns would study, the window is the focus within the parlor. The seating provides an opportunity for reflection, the benches sit beside a steel framed table, although this has no top on which to lay things on. Hovering just above where the tabletop should be is a teapot, two cups and two saucers. This is the conceptual memory of all the various ceremonial activities that this house, moreover, this room will have seen over the years. Concealed inside each of the pieces is a speaker with recordings of the folk song ‘A Scottish Soldier’ where the Sutherland Highlanders won great fame as ‘The Thin Red Line’. This would be mixed with excerpts from the Iliad and stories about daily life as a Nun. Each sound bite is activated as the participant went to use the tea set, thus they themselves become a protagonist in the narrative of the house.